Note: only the project owner (the person who originally registered the site with GoSquared) has permission to invite new team members. What permissions does a shared user have? If you manage more than one GoSquared project (ie. you have GoSquared installed on multiple sites), you can be selective about which projects you want to share access to. Please note that only the project owner can invite team members. If you are not the project owner, you'll want to ask them to complete the process below. 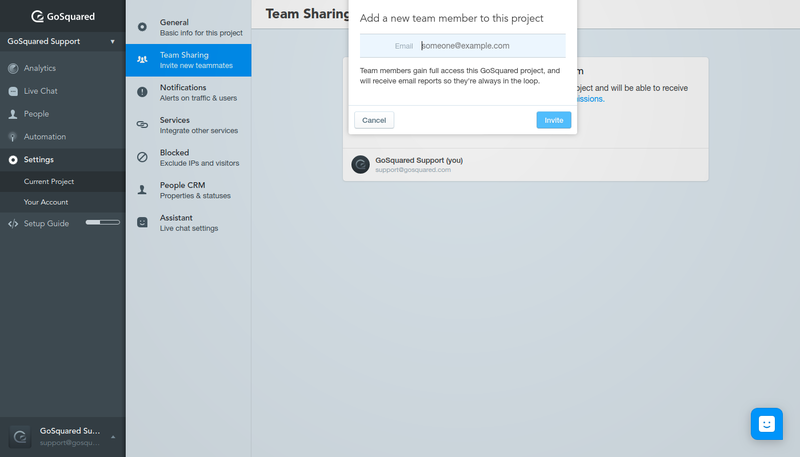 To invite a team member to use GoSquared for this website, select Add team member and enter that person's email address. Your team-mate will be sent an email inviting them to jin your GoSquared project. If they don't already have a GoSquared account, they'll be asked to create a new free GoSquared account in order to sign in. 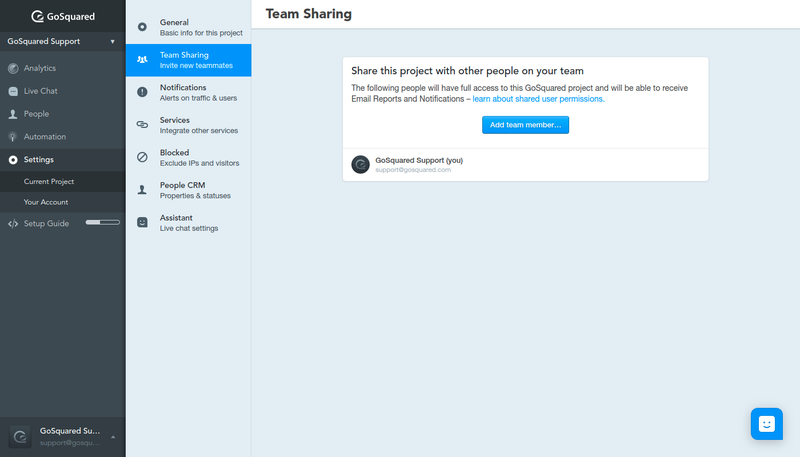 If you want to share more than one project, just switch to that project and send a new invite. GoSquared is designed to be easy for the whole team to use it – not just the "data heads". Put GoSquared up on a big screen near the lunch tables, and invite everyone on your team to GoSquared to start building a culture of greater transparency and raise awareness of key metrics within your team. Everyone you invite will have full access to GoSquared for the website(s) you have chosen, and can also receive emails reports so they're always in the loop. All GoSquared plans enjoy unlimited team sharing so you can invite as many colleagues, friends or collaborators as you wish. If you manage multiple sites, you can selectively share each site with different people. For example, if you are a web design agency, you can share each of your sites separately with each of your individual clients.